Ghana’s President Nana Akufo-Addo on Saturday declared a week of mourning to pay homage to former UN chief and Nobel laureate Kofi Annan. Describing Annan as a “consummate” diplomat, Akufo-Addo said in a statement that Ghana was “deeply saddened” by news of his death in Switzerland on Saturday after a short illness. 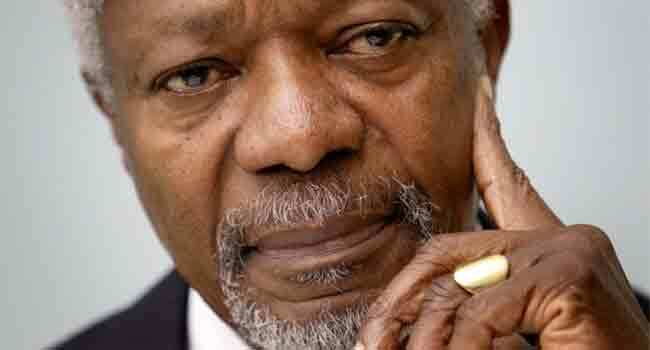 Born in Kumasi, the capital city of Ghana’s Ashanti region, Annan became the first black head of the United Nations. “I have directed that, in his honour, Ghana’s national flag will fly at half-mast across the country and in all of Ghana’s diplomatic missions across the world” for one week from Monday, Akufo-Addo said. “He brought considerable renown to our country by this position and through his conduct and comportment in the global arena,” Akufo-Addo said.